Obama Administration: Sugary Foods Not So Grrreat! 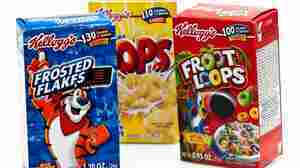 April 28, 2011  The Federal Trade Commission has offered guidelines to companies that market food products to kids. The government wants the food industry to market healthful foods, not the fast food, sugary cereals and salty snacks that make up a lot of the ad market. But even though the program would be voluntary, it still rankles critics who say the government is trying to infringe on companies' free speech rights. 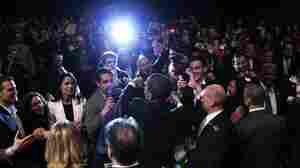 April 23, 2011  President Obama returned from a trip to the West Coast with a few million dollars more in his re-election campaign's bank account — thanks to Hollywood glitterati and other donors. But the real world managed to intrude on the trip as well: Gas prices came up again and again. April 21, 2011  As part of a three-day visit to the West Coast, President Obama kicked off his social media campaign with an online town hall from the offices of Facebook. Obama is trying to sell his deficit-reduction plan. He also is trying to organize supporters and raise money as his reelection campaign gets underway. 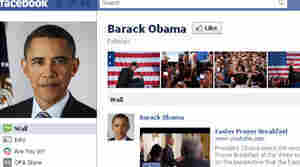 April 20, 2011  Between Sarah Palin's half-million Twitter followers and President Obama holding a town hall meeting at Facebook headquarters on Wednesday, there's no denying that new media will have a huge impact on the 2012 presidential election — and not necessarily in the ways you would expect. April 9, 2011  With one hour to spare, the federal government averted a shutdown Friday night. The budget deal will carry the government through the remaining six months of the fiscal year. April 8, 2011  A look at President Obama's effort to drive the budget process to completion but also demonstrate leadership in the face of a government shutdown. April 7, 2011  Talks at the White House on Wednesday night did not produce a budget agreement, and a government shutdown is still looming. President Obama, Democratic Senate Majority Leader Harry Reid and Republican House Speaker John Boehner left the meeting saying they will continue to work toward a settlement. April 6, 2011  The debate over the federal budget is complicated and chaotic. But it also follows certain predictable rules, like a game of chess. NPR's Ari Shapiro reports on what game theory can tell us about the messy business of politics. April 5, 2011  President Obama held an unscheduled press conference to discuss the budget showdown with Republicans in Congress. Lawmakers face a possible government shutdown on Friday if they don't come to an agreement on the budget. April 2, 2011  One of President Obama's favorite rhetorical devices is to establish the false choices on policy, laying out extreme positions on both the left and the right and placing himself at the sensible center. In his Libya address, he again used the device to explain the policy's complexities. Finding the "Obama Doctrine" political analysts are looking for is proving difficult. March 30, 2011  With gas prices going up and trouble with the nuclear plant in Japan, President Obama said in a speech that the U.S. must become less dependent on foreign sources of energy. He wants to cut American oil imports by a third over the next decade. What Did Obama's Latin America Trip Accomplish? March 23, 2011  President Obama wound up his tour of Latin America in El Salvador on Wednesday. The president's trip to South and Central America has been overshadowed by events in Libya, but the administration believes the contacts and agreements made during the tour will benefit the U.S. in the years to come. March 22, 2011  President Obama spoke about the maturing relationship between the United States and Latin America in Santiago, Chile, Monday. The president said the countries of the region can be a guide for people in the rest of the world who are moving toward democracy. March 21, 2011  While the U.S. military participates in attacks on Libyan air defenses, President Obama continues his trip through Latin America. The White House insists the president can oversee the U.S. military effort while taking meetings with leaders and visiting tourist spots. March 17, 2011  President Obama heads off on a trip to Latin America this weekend. He's due to visit Chile, El Salvador and Brazil — a growing economic and political powerhouse that is looking for a new relationship with the United States.